In picture 1, if the Earth was flat, how is it possible that the lookout tower is higher in the frame than both Graybeard and Pinnacle? In picture 2, how is it possible that Maroon Peak appears significantly higher than Mount Shavano and Mount Harvard? And in picture 3, how is it possible that the much higher Mounts Rainier and Adams appear lower in the photo than Mount Jefferson? 5. Do lots of complicated geometry to work out where the mountains hould appear in a photo if the world was: a) flat; b) a sphere (optional). Maroon Peak is higher than the observer and closer. Those other mountains are a lot further and are shrinking into the horizon. You may well ask why you can raise the tip of your finger higher in your vision over the top of a telephone pole in the distance, as to raise such absurdities. Same explanation as above. Jefferson is higher than the observer, and closer than those other mountains. 5. Do lots of complicated geometry [metabunk.org link] to work out where the mountains would be if the world was a sphere. The argument is like standing next to a one story house and scratching your head in wonder on why a skyscraper in the distance seems lower than the house. Don't get your education from Metabunk. Think for yourself. Wise words. Applicable to more than just Metabunk. But 'those other mountains' are higher than Jefferson. So they should appear higher. The upper red line is "eye level" according to the gauge. If you don't trust that, then the lower limit of "eye level" would at least have to be the summit of North Sister. How, then, can Mt. Adams or Mt. Ranier, both of which are taller than North Sister, ever appear below "eye level" according to EnaG explanation of perspective? It doesn't matter how far away they are. Their summits should never drop below "eye level" if on a flat surface. Firstly, you should know first hand by now from your experiments, that it is difficult for such devices to establish "eye level," if that is what the 0o marker in the image is supposed to mean. Secondly the mountains are higher than the observer. The observer is at 10363 feet. Jefferson is at 10495 feet. It is higher than you. It is also closer than the other taller mountains in the distance. This has nothing to do with special ENAG rules. If you are looking at a mountain in the distance, is it possible to position a lamp post somewhere between you and the mountain to where the lamp post is taller than the mountain? North Sister and South Sister are 4.3 miles apart. 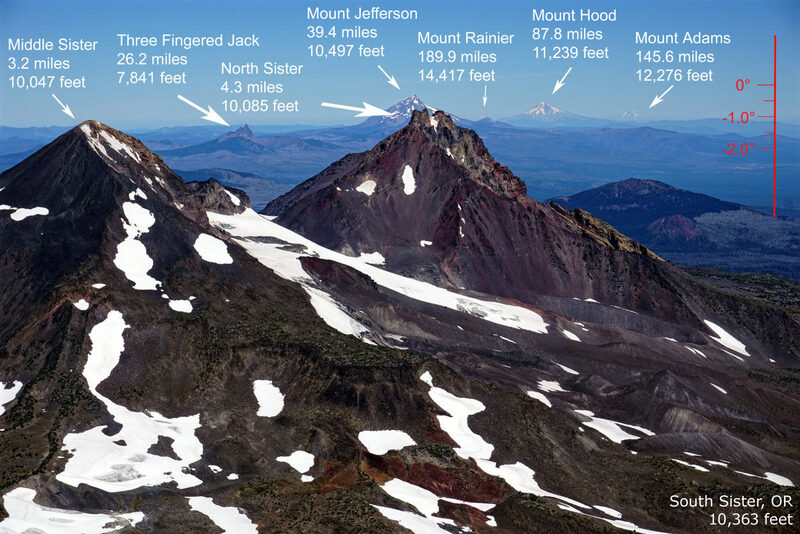 South Sister summit is 278' higher than North Sister. Sightline from S peak to N peak is -0.7° declined from "eye-level"
Adams and Ranier are below that even. Though higher than the viewer, they fall below eye-level, even if I give you -0.7° of error. But the inclinometer gauge and the geometry work out to support 0° is where the gauge says it is. And I threw Peakfinder in there too, to corroborate. There's no way "eye level is so low as to be below the summit of Ranier in the distance. That would cut through the summit of North Sister, which is below the elevation of South Sister. Can't work. Work it out. Think for yourself. Oh for four, Tom. Though, to be fair to you, you make a decent point: it's just that saying it isn't really the same as proving it - for that you'd need to do some calculations, and maybe draw some diagrams. For example, as I look out my window right now, there's a tree about ten feet away, maybe eight feet tall; then a tree about sixty feet away, around fifteen feet tall; and then a hill, about half a mile away, around 300 feet high. Yet: the smaller tree seems highest, then the taller tree, then the hill. If I know the distances and elevations I can work out the angle between my eye and the objects: the larger the angle, the higher the object will appear in my view. So to take your house and skyscraper scenario, let's say the house is 25 feet away and the top of it is 25 feet above my eye: that makes the angle I look up to the top as being 45°. But what about the skyscraper? Will it appear higher or lower than the house? Well, that all depends on the angle I'm looking up at it at - and that all depends on how tall it is, and how far away. With this scenario I've made it easy, by using 45° for the top of the house: basically, if the skyscraper is taller than it is distant, it will appear higher; and if it's more distant than it is tall, it will appear lower. Now just do the same for the mountain ranges pictures and see how it works out. And just to point out to you: I'm the one who wrote the original posts on metabunk too. On a flat earth, there's only one way I can think of for the yellow line to be "eye level" and cross the 14.4K Ranier in the distance and the 10.1K North Sister 4 miles away. Is it that light doesn't travel as we think it does, but rather jumps around all over the place, alighting on distant peaks in just the right way to make them fit with the geometry of a globe, out of cheer coincidence? It's a trust issue. The claimed elevation from which the photograph was taken would have to be wrong or a lie. Of course, then the geometry of the rest of the peaks could be checked to corroborate the claimed height, but I'm not going to do that. If Tom wants to salvage the perspective and eye-level argument for flat earth, and cast doubt on the height of the photographer, I'll leave that chore to him. I'm going to trust that the photo WAS taken at 10.3K and so the taller Mt.s Adams and Ranier really are below eye level. Yes, I had thought of that one also: the peaks aren't really that elevation, they're just reported as that elevation so that it matches Round Earth geometry when viewed from another peak with an elevation of God knows what. Of course, that's only feasible for one of those mountains looking in one direction - but impossible if someone should, say, take a look from one of the other mountains and look in another direction. Everyone can see the concept clearly. Draw calculations and draw diagrams to combat your personal errors with the world? And just to point out, being as the blindingly obvious hasn't occurred to you, I'm the one who wrote the original posts on metabunk too. First off, to make things simpler, how about we cut off 5376 feet from the elevations, and pretend that's ground level. Now we the viewer are at 105 feet. The lookout tower on Fryingpan, 5.5 miles away, is at 20 feet. And Pinnacle, 41 miles away, is at 291 feet. To use Tom's analogy, it's not so much that we are standing next to a house looking up at a skyscraper, but rather that we are looking out the 10th floor window of an apartment building, and between us and the skyscraper there is a single storey house (the lookout tower). In what universe, pray tell, will the house be higher in our view than a 29-storey skyscraper eight times as far away? I'm not sure you can. If I am viewing a 4,000 peak from the same height, then anything behind, that lines up with that peak, must be the same height. Anything that appears lower, is lower. Do you agree with that? If so, explain those pictures. The closer peaks that were pointed out in Examples 2 and 3 of the OP were higher than the observer, not "the same height." Questioning why mountains that may exist beyond it are shrunken is the same as questioning why a skyscraper is smaller than a one story house in the foreground. Very faulty logic there, Tom - and I think you know it. This time let's cut off 14,005 feet, to simplify things (simplifying is good). Now we the viewer are at 100 feet; Pyramid Peak is at 20 feet; and Mount Shavano is at 226 feet. Let's make 10 feet = 1 storey, as in the example above. So how is it that the 22-storey 'Shavano Towers' appears lower than a 2-storey house when viewed from the 10th floor of an apartment building? You're right: you don't need a diagram to work out the impossibility of that.